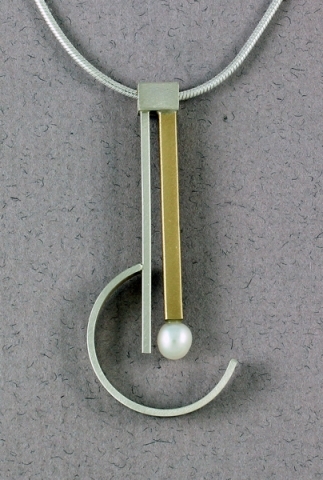 From Mar of Santa Barbara: Sophisticated Sterling silver and Nu-Gold necklace with a pearl accent on an 18" sterling silver chain. The pendant measures 2"H x 3/4"W. Snake chain included. Note: Most items are in stock and available to ship within 24 hours. Any item not in stock will typically ship in 2 to 3 weeks. If time is essential, please contact us and we will be happy to let you know what is available for immediate shipment. Sterling silver is an alloy of 92½ % Silver (.925) and 7½ % (.075) of a base metal - usually copper. Pure silver is almost perfectly white, very ductile and malleable. It is considered too soft for jewelry or flatware use, therefore the addition of small amounts of a base metal serve to harden the alloy. Nu-gold is a brass alloy that has been specially formulated for jewelry and is also known as “red brass,” “Merlin’s Gold,” and “Jeweler’s Bronze.” It has a rich warm color and if highly polished resembles gold without the high cost of gold. Nu-gold contains 85% copper and 15% zinc and no nickle. It tarnishes considerably slower than copper, and is easy to clean.